You can rely on celox to stop bleeding when you need it most without generating heat. Celox is easy to use (just pour, pack and apply pressure), very safe and extremely effective. When mixed with blood, celox forms a robust gel plug in 30 seconds. This clotting action is independent of the bodies normal clotting processes. Celox’s clotting ability has been proven to work in the presence of common anti-coagulants such as warfarin. Fast, safe, effective, affordable-celox is great for pets, horses and livestock too Life-saving blood-clotting product available for home, work, school, and play. Details: You can rely on celox to stop bleeding when you need it most. 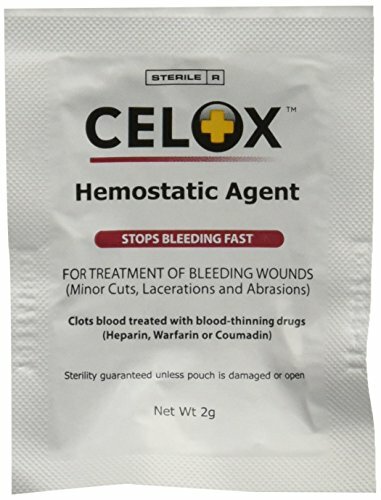 Celox works on all bleeding wounds; from minor cuts and grazes, to severe wounds. Celox is easy to use (just pour, pack and apply pressure), very safe and extremely effective. When mixed with blood, celox forms a robust gel plug in 30 seconds. This clotting action is independent of the bodies normal clotting processes. Celox’s clotting ability has been proven to work in the presence of common anti-coagulants such as warfarin. Tested by the u.s. Navy in Jacksonville, celox was the only product to guarantee 100 percent survival. Proven to be effective originally developed to assist military medics, celox provides fast, effective first aid for men, women, children and older adults, and it’s easy to use even if you have no first aid or medical training. Celox has even been proven to work in the cold (in cases of hypothermia). This potentially life-saving blood clotting agent is available in two convenient sizes, three and six packages of 2-gram packets. 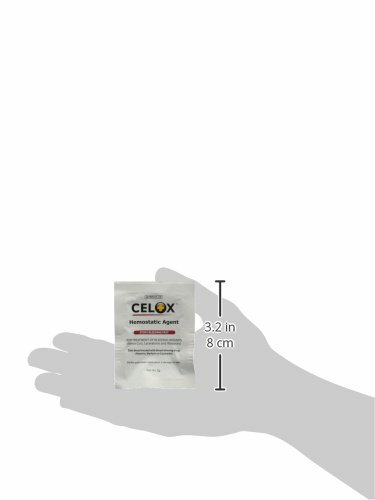 Celox first aid granular pour directly on a wound and apply pressure–it won’t sting or burn. Bleeding typically stops within 30 seconds. A must-have for every first aid kit celox first aid products are easy to carry in your purse, briefcase, backpack, gym bag, glove compartment, tool box, or tackle box.